The London Metropolitan Police Central e-Crime Unit arrested 15 men and women who stole nearly $10 million from online bank accounts in only 3 months. The gang infected the personal computers of unsuspecting Internet users with a mass-market crimeware trojan named "Zeus" and transferred the money out of their victims' online banking accounts. Police representatives said the total amount of money stolen will likely climb as the investigation proceeds. The Zeus trojan is a very effective piece of "crimeware," software designed to conduct online crimes, that can be purchased for $300 on black market websites. Willing criminals do not have to be computer experts to operate a Zeus network. The authors of the Zeus trojan have automated most of the details of the crimeware's operation, and even offer guarantees that it will not be detected by antivirus programs. The Zeus trojan comes with a "Command and Control" server that collects stolen data and can be configured to control hundreds of thousands of infected PCs, issuing instructions on how and where to transfer funds automatically out of online bank accounts. The Zeus trojan is a top money-earner for online criminals worldwide. We use Zeus in our tests of SafeCentral WebProtection and verify that SafeCentral blocks the trojan's data-stealing features. 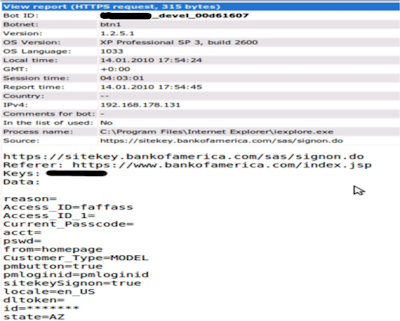 Below is a screenshot from a control test of the Zeus trojan, showing keystrokes being collected out of a Bank of America online banking session when SafeCentral is not being used. Patented Data Loss Protection from SafeCentral, Inc. It's been a busy summer for SafeCentral and I am eager to share the results of our hard work. We've put out a couple of press releases recently that hint at the action going on behind the scenes: we got the first of 5 patents assigned to our Trusted Security Extensions (TSX) technology and just completed the sale of our antivirus business to Commtouch. First I'd like to say that the Commtouch folks have been a real pleasure to work with over the summer as we put together a deal that makes a ton of sense both to them and us. That transaction allows us to focus on proactive data and application protection powered by TSX and embodied in our SafeCentral product. TSX brings unparalleled protection to sensitive data for consumers and enterprises alike. There is no better signal of our focus than renaming the entire company to SafeCentral, Inc.! We will be launching a new website in a couple of weeks that takes the wraps off some additional products we are bringing to market. Our consumer product is going strong--we will be announcing several distribution partnerships for SafeCentral over the next few weeks. We will also be announcing some of the new things we have been working on for enterprise customers. Here is a sneak peek at endpoint data protection for thin client access methods such as Virtual Desktop Infrastructure (VDI), Virtual Applications, and Remote Desktop.